Thanks a lot to Swasky and his team for the organisation, bravo! It's been just wonderful. Meeting people, and testing techniques. Helping as a translator for Veronica Lawlor's workshop, I got 3 opportunities to be able to go out of the confort zone. Instructors and sketchers give you so much confidence, you close your eyes and jump in the testing spirit, wow wow wow ! 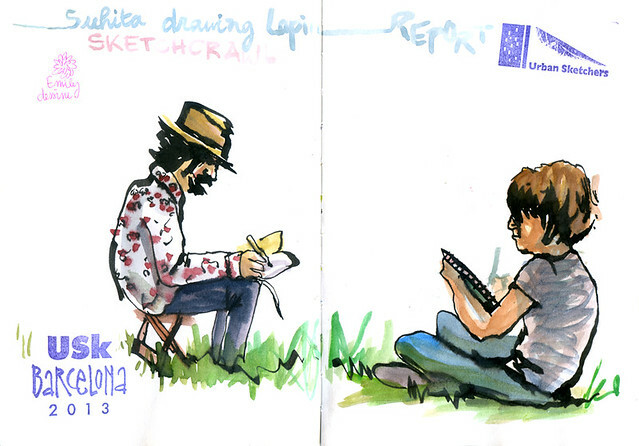 Workshops are also a great moment to meet sketchers and speak about styles. For example Celia Burgos plays with black ink and bleach. Awesome ! There are workshops during three days. 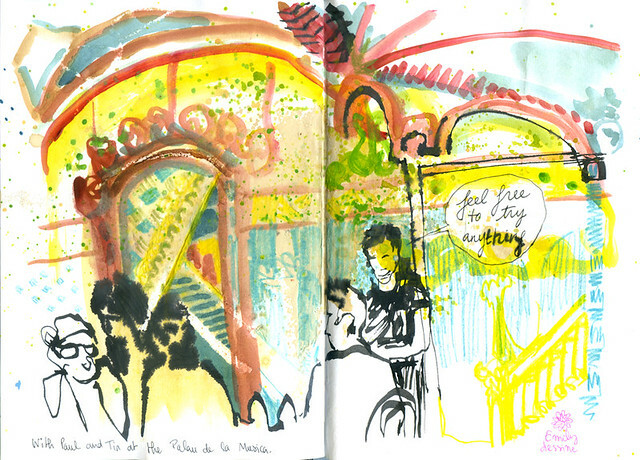 In the morning I stroll about Barcelona's labyrinths to join the sketchers. Every morning the same scene : and the best part is "Good night darling, you'd like a beer ?" when it's 8 am. "Well, no thanks, not tonight !" 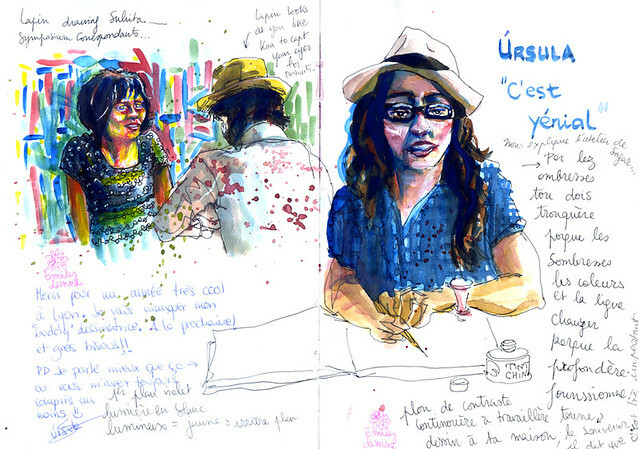 First one with Shari Blaukopf from Canada (and Vincent Desplanche, 2 great aquarellists). 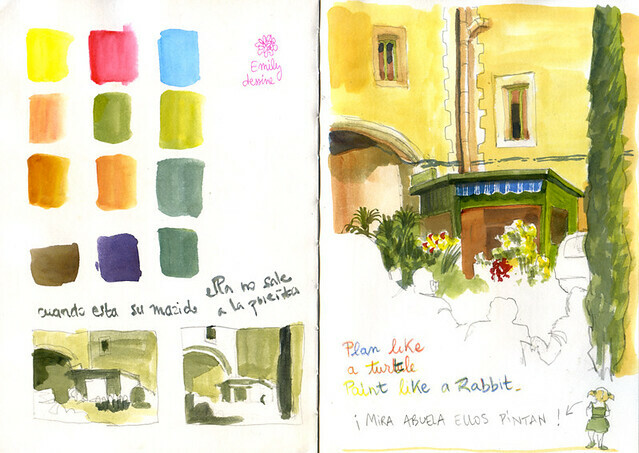 Big constraint : only 3 primary colours, from tubes, making first thumbnail value drawings. You've got 3 hours. Well, I'll change for tubes soon, colours are full of pigments, miam miam ! During the symposium you meet so many people, it's easy to be eating with a Londonian, a Texan, a Thai, an Australian... 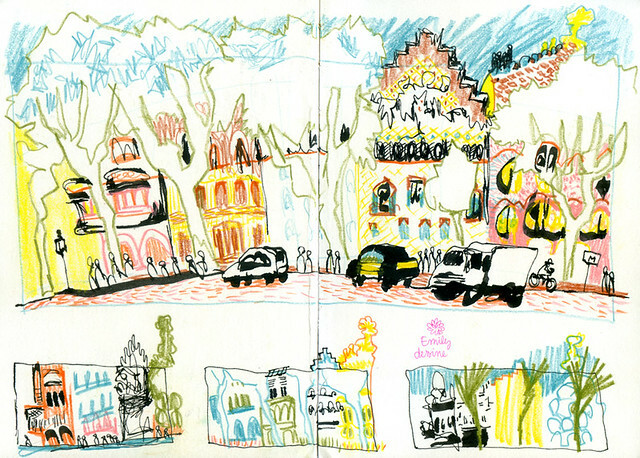 So many countries, so many drawing styles... Usk is all around the world, so guess what ! You can draw everywhere with sketchers, makes me dizzy dizzy ! 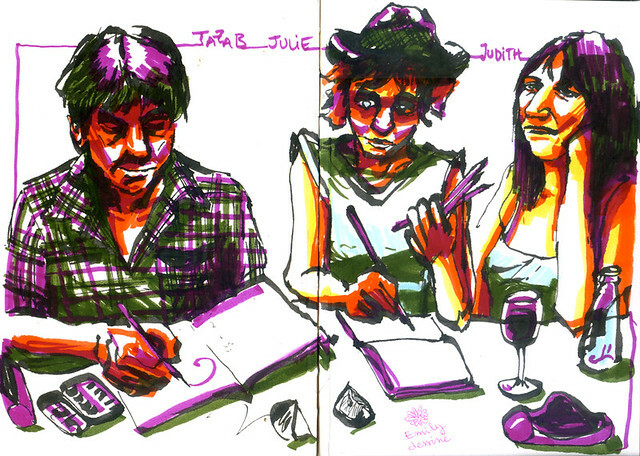 Tazab's come with family, and Judith, his daughter, she draws so well ! 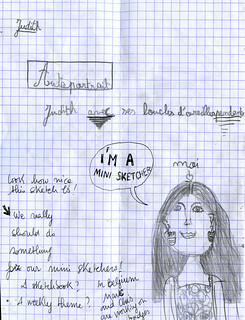 Her brother Thomas is also a great sketcher, and together they inspire such a good idea to Marc and Chris from Belgium : "We should do something for mini sketchers, say here !" ("say here" is part of verbal punctuation in Belgium, I just love it !) As they're coming to the sketchers fair next november in Clermont, they'll bring their machine to make badges "I'm a mini sketcher" and "I love my Usk". Awesome ! Marc also asks "Why not a mini sketchers sketchbook? A mini sketchers blog ?" Something's going on here, to be continued ! 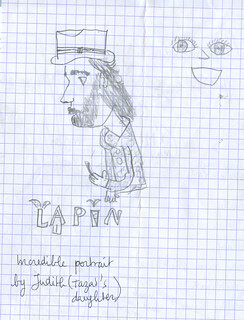 Let's catch Suhita drawing Lapin, and Lapin drawing Suhita, the 2 correspondants of the blog ! 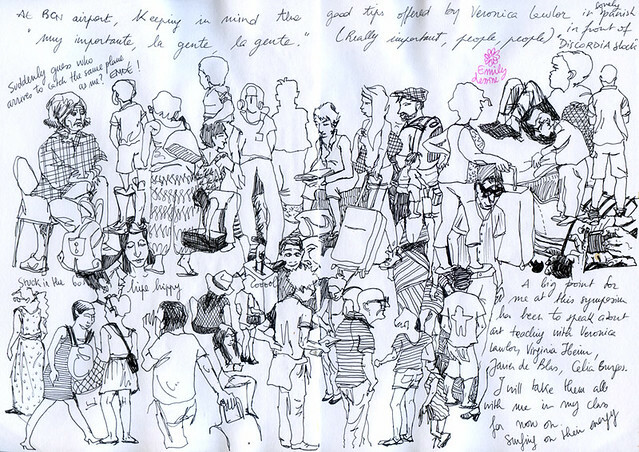 Before the curtain goes down, a souvenir portrait of Ursula, maybe the youngest one of the Urban Sketchers. Well that's it : it's over. That's what I thought while sketching at the airport. But guess who's flying on the same flight ? Emdé ! Sketchers recognize each other quickly, material and sketchbooks, and the head going up and down just like the plastic dogs on a car parcel shelf ! It's a bit sad to go away. Veronica Lawlor cheers us up "à la prochaine" (see you next one) with her nice New Yorker accent, and this is the perfect cuote to end this. Back to France, each time I hear "à la prochaine", it brings me back to Barcelona... We'll surf on this great energy ! Emily, this is great - you really captured the feeling of the whole event! Formidable compte rendu, si vivant qu'on sent encore le vent catalan nous battre le visage ! 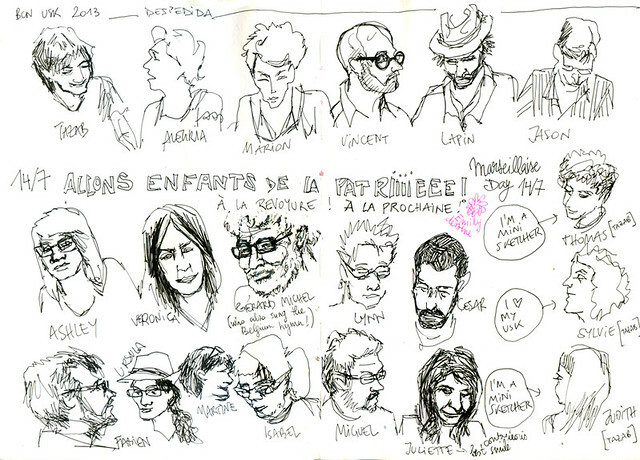 Et tes portraits ! Ils sont vraiment saisissants ! Bravo et merci ! 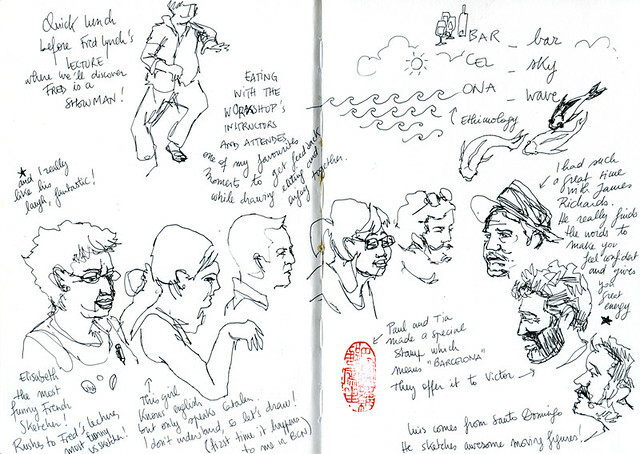 Great summary plenty of good vibrations and wonderful sketches!! Oui, c'est super bien résumé ! Et merci de mettre en lumière quelques artistes que je ne connaissais pas encore. Bisous ! Thank you guys, I miss you ! oh, c'est bien ça emily! fantastique!! I wish I could still be there with you all!! Oui super sympa! Je regrette juste de pas avoir plus vu certains, et notamment cette soirée du 14 juillet dites donc! A bientôt en novembre! Ou avantau gré des vents de chacun! Thank you for sharing your art and enthusiasm! Hopefully see you soon, wherever the next symposium will be held or before somewhere else!!! 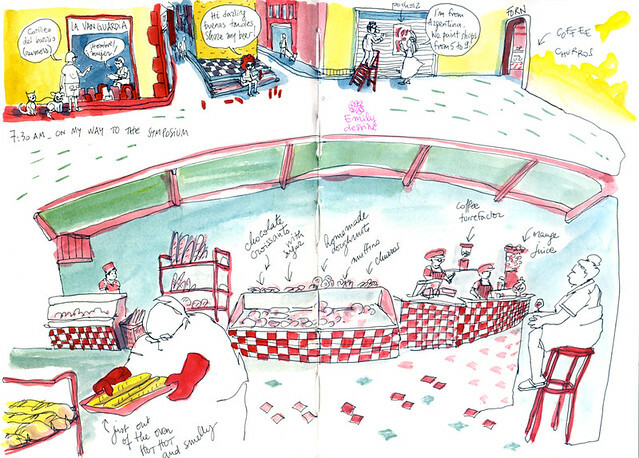 These are so colorful and lively, Emily, and I especially love those character drawings! Great workshop reportage too! Merci, Emily, for sharing all your souvenirs from the symposium. Great drawings and good words. The best result ! Wonderful report! Thank you for sharing.